Preheat your oven to 400 degrees F and grease an 8×10 inch casserole dish with 1 tbsp of butter. Peel and cut the potatoes into 1/2 inch pieces. 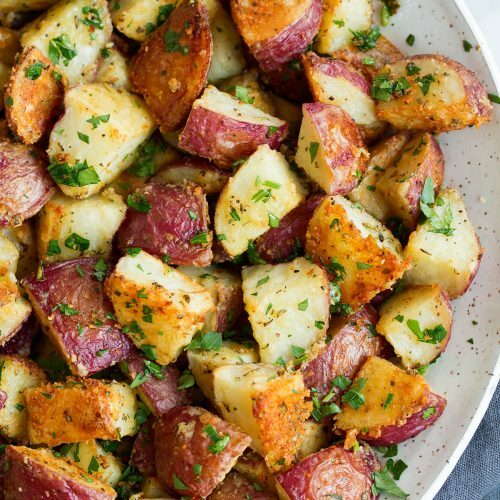 Place the potatoes in a large mixing bowl and toss with 2 tbsp of olive oil. Sprinkle on the Italian seasoning, garlic, salt, pepper, red pepper flakes, and half the parmesan cheese. Stir to coat the potatoes with all the seasonings. Pour the potatoes into the prepared casserole dish and bake for 30 minutes. Remove the potatoes from the oven and sprinkle with the remaining parmesan cheese and about 1 tbsp of olive oil. Bake for 25 more minutes. Place them in a serving dish and pour any remaining parmesan cheese and about 1 tbsp of olive oil. Bake for 25 more minutes. Place them in a serving dish and pour any remaining olive oil over them and garnish them with fresh parsley.